Does it have a tuber? This picture shows two flowers of Paliavana gracilis. It was taken on 16 October 2015. Compared to Mauro's plant below and the picture on his web site, the corolla striping is very faint. Note the long, slender calyx lobes. The color in the photograph is approximately correct. It took several tries and plenty of tinkering with camera settings to get even that close. The photograph at the right was taken in the greenhouse of Mauro Peixoto in Mogi das Cruzes, São Paulo State, Brazil, in April 1999. The plant is therefore an autumn bloomer, since April in the southern hemisphere corresponds to October in the northern hemisphere. As can be seen, this a shrub and probably not a good light-garden candidate. This photograph shows flowers and flowerbuds on the same plant. The corollas are campanulate. This means the flowers are probably bee-pollinated. 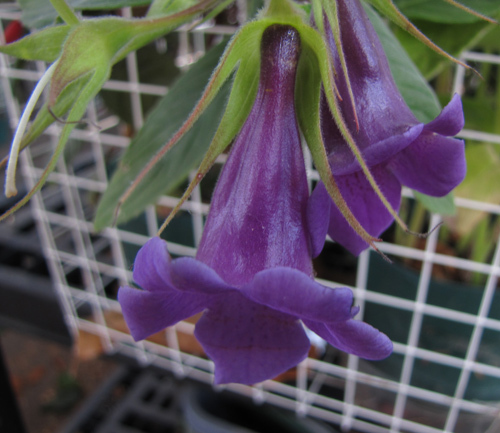 The "campanulate flowers" feature has been used to distinguish paliavanas (non-tuberous sinningias with campanulate flowers) from vanhoutteas (non-tuberous sinningias with tubular flowers). The calyx lobes are long and narrow and separate for most of their length. There are two good calyx examples visible in the picture after the corolla has fallen -- one in front of the stem at center right, and the second just to the left of the stem at the bottom of the picture. Compare with the calyxes in the picture at the top of the page. 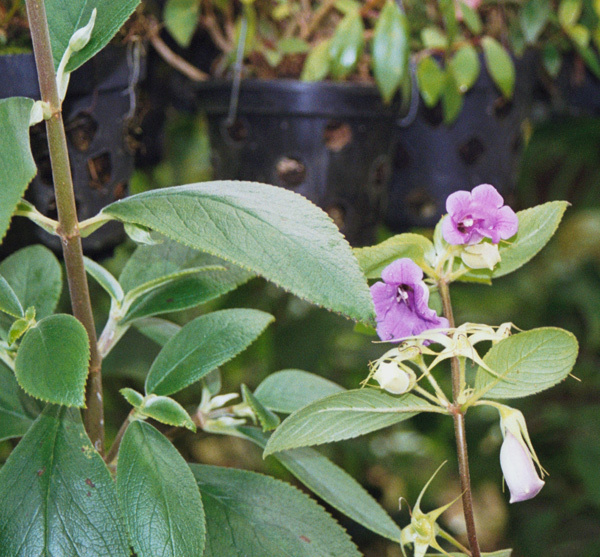 The developing flowerbud at the lower right of the picture, with the flimsy calyx lobes hovering around the unopened corolla, and the even less-developed flowerbud just underneath the left purple flower show that this species is a member of the "free calyx lobes vanhouttea clade", even though it's a paliavana. As it happens, the plant right next to it, visible in the left half of the photo, is something different. See the flowerbud at the upper left in the picture. The calyx completely encloses the developing flowerbud. This feature and the white wool surrounding the flowerbud mark this as Vanhouttea lanata. In March 2014, I dug up an apparently dead plant. What I found is shown in the picture at the right. 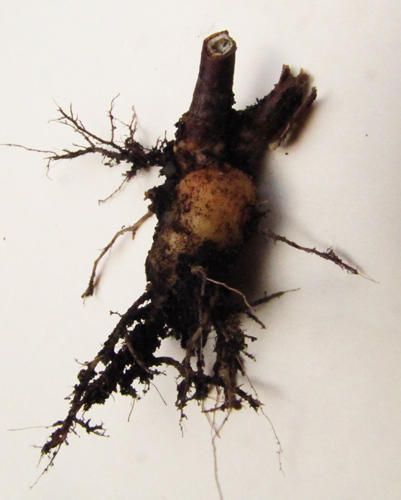 This is certainly a very tuber-like structure, although it is attached to stems which don't seem to be the sort of deciduous stems that usually grow from tubers. Dormancy At least one plant has something that very much resembles a tuber. The plants do not defoliate in the winter. Season Late summer to autumn. Flower Campanulate corolla bulging slightly below, purple, 3-4 cm long. Exterior of corolla tube glossy. Hardiness This plant has survived 28 F [-2 C] outdoors in my back yard, without damage. 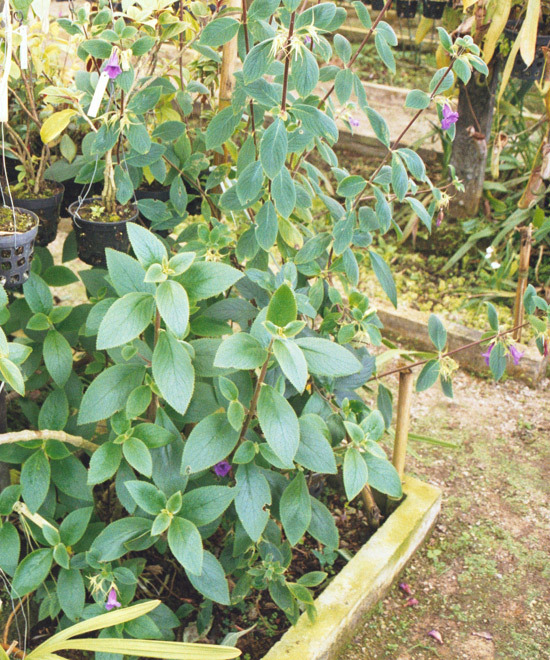 It may be the most cold-tolerant of the paliavanas. However, the winter of 2013-14 reached 27 F and that one-degree difference in temperature made a big difference in outcome. Most of my plants died, with only a couple in sheltered locations surviving. It did, however, lead to the discovery of the tuber. Taxonomic group The free-calyx-lobe vanhouttea clade (even though it's a paliavana). Habitat In the uplands of Minas Gerais and on both sides of the border with Espírito Santo state, Brazil. For some habitat pictures and information, see the page on Mauro Peixoto's web site. Paliavana gracilis was first published by Martius (1829) as Gloxinia gracilis. Alain Chautems transferred it to Paliavana in 2002. Chautems points out that the original publication cited as locality (what is now) Rio de Janeiro state, where P. gracilis has never been collected since, and mentioned a tuber, which no subsequently collected or cultivated material of P. gracilis has ever exhibited (but see above). He therefore suggests that the original publication was actually that of a form of Sinningia speciosa, whose wild-type "slipper" flowers bear a resemblance to those of P. gracilis. Etymology: Latin gracilis ("slim, slender"). See the pronunciation guide.